Previously, I talked about the mobile phone and the importance of a small business being able to communicate their targets. We touched on the importance of mobile websites and the importance of the user being able to access information quickly and easily. We touched on the importance of keeping up with the trends of mobile and reaching customers where they’re getting their information. So lets take it a step further. My quest into mobile continued as I sat down with a contact of mine as he brought up the idea of doing mobile apps. Two weeks later, I attended a presentation and was introduced to the world of push notifications and the endless possibilities of industries that could leverage mobile apps for their marketing efforts. Immediately I knew this was an important solution that we needed to start offering to our clients. In October 2013, the number of apps in the Apple App Store hit 1,000,000 almost tripling from 350,000 in March 2011 according to About.com. Three months before in July 2013, the number of apps in the Google Play Market hit 1,000,000 from 200,000 in April 2011 according to AppBrain.com. 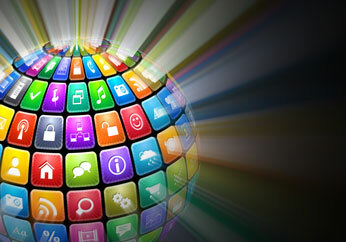 Businesses have started to recognize that keeping with up with the trends of apps is essential. In 2009, the number of cell phone users who had a smartphone was only of 18%. Now in 2014, 58% of all cell phone users have smartphones according to Pew Research. The time spent on apps has more than tripled as well. In June 2010, the average user spent 43 minutes a day using mobile apps versus 64 minutes a day web browsing. By April 2014, the average user spends 144 minutes a day using mobile apps, while internet browsing has decreased to 18 minutes per day according to Geekwire. With the trends changing, apps are becoming an essential way for a businesses to operate, as websites. When having a design firm or an agency develop an app, there are several important things to consider. An app is a one on one direct relationship with your audience, creating a direct link to your product or service. However an app is only as good as the usability and the call to action it creates. Imagine being a restaurant or bar. Monday nights are the slowest night of the week. Imagine being able to announce a half off drinks special and your establishment is suddenly full with customers. Recently we sold an app to a popular pub in the Madison-area. While the app has their menus, specials, and contact information in the palm of their customer’s hand, the pub was excited to be able to use the push notification feature on the app to send out specials, inform patrons of events or a cancellation to name a few. We also built in a GPS feature. A user can be away from the pub and use the feature to get turn-by-turn directions to the pub. If an establishment has multiple locations, a user can be guided to the closest location. For an app to work for a business, you must create a call to action. Offering a way to bring top of mind awareness is key. Organizations from schools to universities to realtors to restaurants have utilized apps for this purpose. Another recent success is a pizza chain in Ontario, Canada. In early 2011, the chain Pizza Pizza launched an app trying to streamline ordering and delivery. Encouraging people to download the app, within six weeks of the launch, Pizza Pizza met their six-month performance metrics. The company then went on to win the Webby Award (honoring innovation in web and mobile) as a smartphone-shopping tool. Apps are often utilized as an internal tool for a business as well. A construction company recently inquired into having us develop an app to use as a tool that they could have their employees use as a way to show before and after pictures to their clients. Although the industry is moving to the mobile phone, and mobile apps are a cost effective solution ranging from $3000-$20000, it’s still important for a business to realize that an app should compliment their currently marketing and branding efforts. Insuring that the design of the app maintains brand consistency and the features create a call to action will assure that the app is a success. Currently apps are in the early adopter phase, but as time passes, the demand for mobile is going to continue to grow. Being an early adopter will show your customers that you are willing to keep up with the trends and ensure that your business will be successful. Look forward to our next post in mid-October.